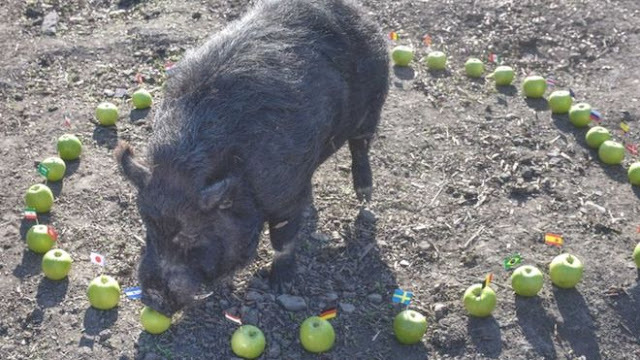 Derbyshire - A pig with "special powers" has chosen the four nations that will reach the World Cup semi-finals - and England is not one of them. Mystic Marcus, a micro pig from Heage, Derbyshire, chose Belgium, Argentina, Nigeria and Uruguay. He did it by eating apples marked with the flags of all the other teams. Stevens has about 100 animals on her farm, but Marcus holds a "special place in her heart". She said: "He's got a lovely personality, he's totally unfazed by all the fuss. He's really chilled out and happy to go and do stuff. He takes it all in his stride." However, despite the breeder's claim of a "100 percent success rate" Mystic Marcus has slipped up a few times.